Welcome to The New Waterfront Million Dollar View! This home has 27ft vaulted ceiling in the living room with 60' Flat Screen TV. Every room has plasma flat screens, and DVD players with a great selection of movies & great novels. Last house on the waterway with a wraparound balcony has unobstructed sunsets and sunrises located on a bird sanctuary.Enjoy the double pillow hammock in the Waterfront Tiki or a cocktail at the bamboo bar. Want to go Dolphin and Manatee watching? HA! You don't have to go far! Just step outside on the dock to see a multitude of wildlife. mackrel, tarpon or into the Gulf of Mexico. Features are:Waterfront Tiki Hut & cable T V with bamboo bar. Bamboo moon chairs with double pillow hammock. Come and enjoy yourself ! * Large kitchen with granite bars inside and out. * Huge master bedroom,with king bed 18 foot with vaulted ceilings. * Master bath has tile and Glass block walk in shower. * 2 private master bedroom balconies see miles of waterfront views. * Access to Tampa Bay and Gulf of Mexico - No fixed bridges. We splurged to get this rental property because it offered so much. The views were a big attraction to me as well as the direct access to the water. The map showed that it was pretty central to all the attractions that we wanted to see in our one month stay. Having kayaks was important as well as I intended to renew my former passion. Well it surpassed all of these expectations and more. The owners were right there on the property and were not only helpful but generous with their time as well. The lagoon was filled with exotic Florida birds nearly every day. An osprey sat as a sentinel just outside our windows every morning. If you like to fish, or kayak or explore all the interesting things that Tampa area offers, then I highly recommend this place. Very nice, how ever the home needs some visible improvements. It’s a nice home please don’t get me wrong, but there is some updating needed ASAP. The door in the master bedroom bathroom, has much water damage. The bed headboard just sits on the dresser not secured and feel off on us, we could not rent the boat as told when we rented the home, apparently there was some last minute insurance issues, the area is not real good for fishing, referring in back of the home as I thought from the back, I was really planning on fishing ALOT from the home but had to go off property to find fish, mainly the piers we went to. The owner is very nice no question and took us out for a morning or fishing but it’s not the same as taking the family out as planned months in advance. Over all the home is a 7out if 10 stars. The air hockey table is for looks and not really for use, it should be taken down if would look better and orettt beat up, in the main room. Beware if you have stair issues you have about 20 stairs going up to the second level to enter the home and the master bedroom there is another 15+ stairs when you get inside it’s a little work for sure, but it’s a beautiful view as advertised, it’s just the home needs updating for sure, if I knew the area better there is nice resorts for $200-250 a night with just more for the family to do. It just was not what I was expecting for my family, we are into fishing big time and going on the water so it was a disappointment for sure not having good fishing or use of the boat. Again the owner was more then nice but a family Florida vacation is only once eveey 2 years for us, I felt I let my family down, however I did the best I could with what I was told, things just didn’t work out unfortunately. Awesome views with a great host! We had an amazing time while staying there! We stayed a week and decided to stay one extra day. I was born and raised in Tampa but moved to Virginia and started a family so my kids had never been to Florida so our trip was a way of showing them where I'm from and how I grew up. Larry was awesome enough to take myself and my oldest son out fishing in his boat and showed us some great spots to fish and see wildlife. My son was absolutely amazed wants to come back next year. We visited many places while down there and it was always nice to come back to the house and relax. My wife and I would have coffee outside on the deck every morning before waking the kiddos for the day's events. I will try and make this a tradition of staying here whenever we can come back down and would recommend to anyone. We traveled from the UK for a week and we were very impressed. The location of the house is excellent for exploring the area. The house was larger than it looks and is very well equipped with everything you could need. The wrap around balcony was great and could be accessed from all rooms. The master bedroom on the top floor even had its own balcony. The owners Larry and Debbie were so welcoming. They gave us lots of ideas about where to go on days out. On Sunday they made us a tray of smoked chicken which was delicious. We had a fantastic time and would definitely recommend staying here. What an incredible vacation. We stayed for a week and loved every moment. Mr. Larry met us as we arrived, gave us the tour, and even helped us put our boat in and out of the water. 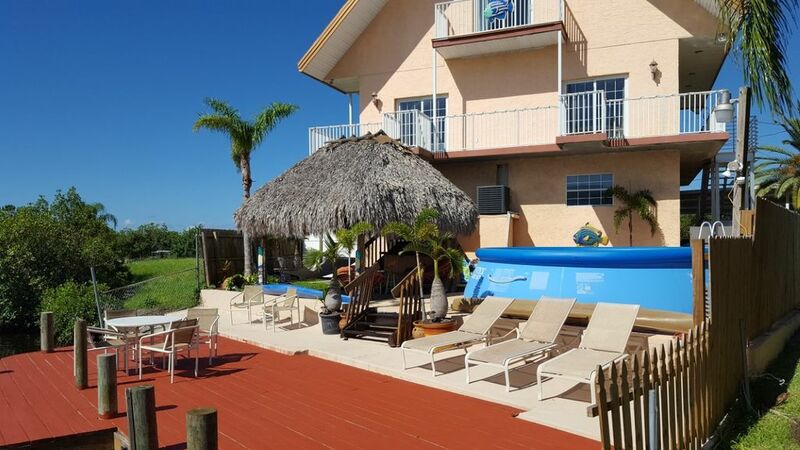 The House was exactly what the photos show, the views are outstanding, and it’s in the perfect central area to enjoy everything from beaching to Busch Gardens waterpark fun. We really liked taking our boat down the channel to fish in Bay and the evening sunsets from the wrap around porch. We will most definitely be returning to the Milllion Dollar View home.Thank you Mr. Larry for you hospitality and great conversation. There are several restaurants including Applebees, The Outback Steakhouse, City Fish fresh seafood chilies olive garden and The Bahama Breeze just 4 miles away on the water, just to name a few! snook, spanish mackrel, tarpon,& jacks and blue crab. We are currently offering a 20ft SEA FOX center console boat with a 150 hp Mercury motor along with the house for $1750.00 to 1850.00 per week, or just rent this Million Dollar View for $1250.00-1350.00 per week plus tax.